Some aspects of administering an application container are similar to administering the CDB root and the CDB as a whole, while other aspects of administering an application container are similar to administering a PDB. The ALTER DATABASE statement can modify an application root. The ALTER PLUGGABLE DATABASE statement can modify the open mode of one or more application PDBs. You install, upgrade, or patch an application in an application container. You can also uninstall an application from an application container. You perform these operations in the application root, and the application container propagates the application changes to the application PDBs when the application PDBs synchronize with the application in the application root. Application common objects are shared, user-created database objects in an application container. Application common objects are created in an application root. A DML statement issued in an application root can modify one or more containers in the application container. In addition, you can specify one or more default container targets for DML statements. Container maps enable the partitioning of data at the application PDB level when the data is not physically partitioned at the table level. Administering an application container is similar to administering a CDB because you can manage both the application root and the application PDBs that are plugged into the application root. However, administering an application container is also similar to managing a PDB because changes to the application container do not affect other application containers or PDBs in the CDB. The following table describes administrative tasks for application containers that are similar to administrative tasks that manage a CDB or CDB root. Application common users and privileges are similar to common users and commonly granted privileges in a CDB root, but in an application container, common users and commonly granted privileges only exist within the containers of the application container, including the application root, application PDBs that belong to the application root, and an optional application seed that belongs to the application root. A common user whose current container is the application root can create application PDBs that are plugged into the application root. "Creating and Removing PDBs with SQL*Plus"
A common user with the proper privileges can switch between containers in an application container, including the application root, application PDBs that belong to the application root, and an optional application seed that belongs to the application root. "Switching to a Container Using the ALTER SESSION Statement"
The ALTER SYSTEM SET statement can dynamically set an initialization parameter in one or more containers in an application container. In an application container, some DDL statements can apply to all containers in the application container or to the current container only. "Modifying Application Common Objects with DDL Statements"
The following table describes administrative tasks for application containers that are similar to administrative tasks that manage a PDB. The application root has its own service name, and users can connect to the application root in the same way that they connect to a PDB. Similarly, each application PDB has its own service name, and the application seed has its own service name. "Accessing a Container in a CDB with SQL*Plus"
An ALTER PLUGGABLE DATABASE statement can modify an application root, application PDB, and application seed in the same way it modifies a PDB. For example, an administrator can open or close an application root with an ALTER PLUGGABLE DATABASE statement. SQL*Plus STARTUP and SHUTDOWN commands operate on an application root, application PDB, and application seed in the same way that they operate on a PDB. An ALTER SYSTEM statement operates on an application root, application PDB, and application seed in the same way that it operates on a PDB. Administrators can create, modify, and drop tablespaces for an application root and for application PDBs. Each container has its own tablespaces. "Managing Tablespaces in a CDB"
Administrators can create, modify, and drop data files and temp files for an application root and for application PDBs. Each container has its own files. "Managing Data Files and Temp Files"
You can create, modify, and drop schema objects in a an application root and in each application PDB in the same way that you would in a PDB. You can also create triggers that fire for a specific application root or application PDB. However, application containers support application common objects, which can be shared between the containers in an application container. Application common objects cannot be created in PDBs. Table 44-3 lists which containers are modified by clauses in ALTER DATABASE and ALTER PLUGGABLE DATABASE statements issued in an application root. The table also lists statements that are not allowed in an application root. Statements issued when the current container is the application root never affect the CDB root or PDBs that do not belong to the current application root. You can use these clauses to set non-default values for specific application PDBs. When the current container is an application PDB, ALTER PLUGGABLE DATABASE statements with this clause can modify the open mode of the current application PDB. See "Modifying a PDB with the ALTER PLUGGABLE DATABASE Statement". In an application container, an application is a named, versioned set of application metadata and common data. A typical application installs application common users and application common objects. You can install an application in an application container. Major changes to an application constitute application upgrades. You can upgrade an application in an application container. Minor changes to an application constitute application patches. Examples of minor changes can include bug fixes and security patches. You can patch an application in an application container. You can migrate an application that is installed in a PDB to an application container. The application can be migrated to the application root or to an application PDB. For example, you can migrate an application installed in a PDB plugged into an Oracle Database 12c Release 1 (12.1) CDB to an application container in an Oracle Database 12c Release 2 (12.2) CDB. When an application is installed, upgraded, patched, or uninstalled in an application root, an application PDB that belongs to the application root is not changed until it is synchronized. Synchronizing an application updates the application in the application PDB to the latest version and patch in the application root. When application containers in different CDBs have the same application, their application roots can be kept synchronized by creating a master application root, a replica application root, and a proxy PDB. The compatibility version of an application is the earliest version of the application possible for the application PDBs that belong to the application container. SQL*Loader is the only supported utility for bulk inserts into tables during application install, upgrade, and patch operations. Only conventional path loads are supported for bulk inserts during application install, upgrade, and patch operations. You can uninstall an application in an application container. Within an application container, an application is the named, versioned set of application common objects stored in the application root. In this context, “application” means “application back-end.” Application common objects include user accounts, tables, packages, and so on. An application can be shared with the application PDBs that belong to the application root. An application can be installed, upgraded, and patched in an application root. When an application is installed, upgraded, or patched, you must issue an ALTER PLUGGABLE DATABASE ... BEGIN statement to start the operation and an ALTER PLUGGABLE DATABASE ... END statement to end the operation. These statements can be issued in the same user session or in different user sessions. When you install an application, you must specify the application version number. When you upgrade an application, you must specify the old application version number and the new application version number. When you patch an application, you must specify the minimum application version number for the patch and the patch number. As the application evolves, the application container maintains all of the versions and patch changes you apply. You can also configure the application container so that different application PDBs use different versions of the application. For example, if you provide an application to various customers, and each customers has its own application PDB, some customers might wait longer to upgrade the application. In this case, some application PDBs can use the latest version of the application, while other application PDBs can use an older version of the application. Install the application in the application root. This step includes creating the application data model and configuring the application common users and application common objects. Create the application PDBs in the application root. Synchronize each application PDB that should install the application with the application in the application root. Load the data for each application PDB. Maintain the application by upgrading it and patching it in the application root. Synchronize application PDBs that should apply changes from upgrades and patches. Add new application PDBs whenever necessary. SQL*Loader is the only supported utility for bulk inserts into tables during application install, upgrade, and patch operations. The application module name is set by the DBMS_APPLICATION_INFO.SET_MODULE procedure or the equivalent OCI attribute setting. Some clauses, such as the SHARING clause, are valid only when they are issued in between an ALTER PLUGGABLE DATABASE ... BEGIN statement and an ALTER PLUGGABLE DATABASE ... END statement. For these clauses, if a session's module name does not match, then that session is not included in between the BEGIN and END statements, and statements that include the clause will fail. You issue ALTER PLUGGABLE DATABASE APPLICATION statements to install an application in the application root. To install an application in an application container, run the ALTER PLUGGABLE DATABASE APPLICATION BEGIN INSTALL statement to begin the installation and the ALTER PLUGGABLE DATABASE APPLICATION END INSTALL statement to end the installation. The application is installed in the application PDBs that synchronize with the application in the application root. You install the application in the application root only, and application PDBs that synchronize with the application install the application automatically. With the automated method, the installation can be done with one or more of the following: scripts, SQL statements, and graphical user interface tools. You must indicate the start of the installation with an ALTER PLUGGABLE DATABASE APPLICATION BEGIN INSTALL statement and the end of the install with an ALTER PLUGGABLE DATABASE APPLICATION END INSTALL statement. Each installation must be associated with an application name and version number, which are specified in the ALTER PLUGGABLE DATABASE APPLICATION statements. The current user must have the ALTER PLUGGABLE DATABASE system privilege, and the privilege must be commonly granted in the application root. The application root must be in open read/write mode. In SQL*Plus, ensure that the current container is the application root. Install the application using scripts, SQL statements, or graphical user interface tools. Ensure that the application_name and application_version_number match in the ALTER PLUGGABLE DATABASE APPLICATION BEGIN INSTALL statement and theALTER PLUGGABLE DATABASE APPLICATION END INSTALL statement. Synchronize all of the application PDBs that must install the application by issuing an ALTER PLUGGABLE DATABASE APPLICATION statement with the SYNC clause. You issue ALTER PLUGGABLE DATABASE APPLICATION statements to upgrade an application in the application root. To upgrade an application in an application container, run the ALTER PLUGGABLE DATABASE APPLICATION BEGIN UPGRADE statement to begin the upgrade and the ALTER PLUGGABLE DATABASE APPLICATION END UPGRADE statement to end the upgrade. Application changes related to the upgrade are propagated to the application PDBs that synchronize with the application in the application root. You upgrade the application in the application root only, and application PDBs apply the changes in the upgrade when they synchronize with the application. Application PDBs synchronize with an application by running an ALTER PLUGGABLE DATABASE statement with the SYNC clause. The upgrade can be done with one or more of the following: scripts, SQL statements, and graphical user interface tools. You must indicate the start of the upgrade with an ALTER PLUGGABLE DATABASE APPLICATION BEGIN UPGRADE statement and the end of the upgrade with an ALTER PLUGGABLE DATABASE APPLICATION END UPGRADE statement. Each upgrade must be associated with an application name, starting version number, and ending version number, which are specified in the ALTER PLUGGABLE DATABASE APPLICATION statements. When an application is upgraded, Oracle Database automatically creates a clone of the application root. During the upgrade operation, application PDBs are pointed to the clone. Applications continue to run during the upgrade operation. Application PDBs can perform DML operations on metadata-linked and extended data-linked tables and views, and application PDBs can query metadata-linked objects, extended data-linked objects, and data-linked objects. 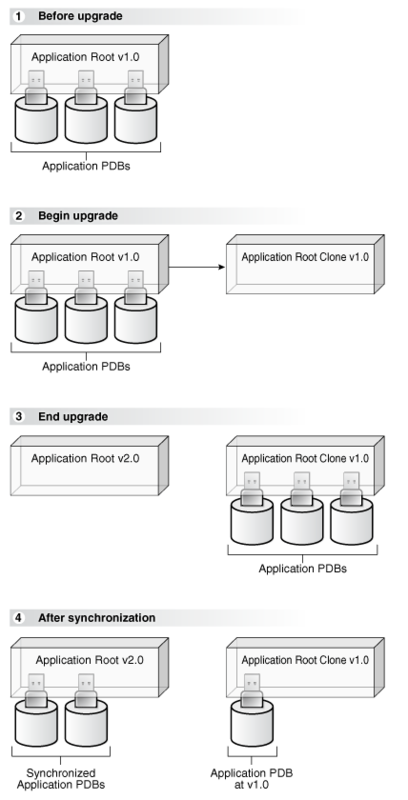 After the upgrade operation is complete, the application root clone remains and continues to support any application PDB that uses the version of the application in the clone. Application PDBs that upgrade are pointed to the upgraded application root. Application PDBs that do not upgrade might continue to use the clone, and application PDBs that are plugged into the application root might also use the same application version as the clone. Figure 44-1 illustrates the upgrade process. Description of "Figure 44-1 Upgrading Applications in an Application Container"
When the application root is in any open mode, the application root clone is in read-only mode. When the application root is closed, the application root clone is also closed. Upgrade the application using scripts, SQL statements, or graphical user interface tools. Ensure that the application_name and application_end_version_number match in the ALTER PLUGGABLE DATABASE APPLICATION BEGIN UPGRADE statement and the ALTER PLUGGABLE DATABASE APPLICATION END UPGRADE statement. Synchronize all of the application PDBs that must upgrade the application by issuing an ALTER PLUGGABLE DATABASE APPLICATION statement with the SYNC clause. You issue ALTER PLUGGABLE DATABASE APPLICATION statements to patch an application in the application root. To patch an application in an application container, run the ALTER PLUGGABLE DATABASE APPLICATION BEGIN PATCH statement to begin the patch operation and the ALTER PLUGGABLE DATABASE APPLICATION END UPGRADE statement to end the patch operation. Application changes for the patch are propagated to the application PDBs that synchronize with the application in the application root. You patch the application in the application root only, and the application PDBs that synchronize with the application apply the changes. The patch can be done with one or more of the following: scripts, SQL statements, and graphical user interface tools. You must indicate the start of the patch operation with an ALTER PLUGGABLE DATABASE APPLICATION BEGIN PATCH statement and the end of the patch operation with an ALTER PLUGGABLE DATABASE APPLICATION END PATCH statement. Each patch must be associated with an application name, starting version number, and ending version number, which are specified in the ALTER PLUGGABLE DATABASE APPLICATION statements. The patch process is restricted to a small set of operations. In general, destructive operations, such as dropping a table, are not allowed in a patch. If you attempt to patch an application, and the operation raises an “operation not supported in an application patch” error, then upgrade the application instead of patching it to make the necessary changes. The minimum_application_version_number indicates the minimum application version at which an application installation must be before the patch can be applied to it. Patch the application using scripts, SQL statements, and graphical user interface tools. Ensure that the application_name and patch_number match in the ALTER PLUGGABLE DATABASE APPLICATION BEGIN PATCH statement and the ALTER PLUGGABLE DATABASE APPLICATION END PATCH statement. Synchronize all of the application PDBs that must patch the application by issuing an ALTER PLUGGABLE DATABASE APPLICATION statement with the SYNC clause. You can migrate an application to an application root by creating an application root using an existing PDB. You can migrate an application that is installed in a PDB by copying the PDB to an application container. After migrating an existing application to an application root, you can use an existing PDB that uses the application to create an application PDB. If the application is installed in more than one PDB, then you can use one of the PDBs to create the application root. You can use one of the methods available for copying a PDB to an application root, such as cloning the PDB or plugging in the PDB as an application root. When common users, roles, or profiles exist in the PDB used to create the application root, you must run procedures in the DBMS_PDB package to associate them with the application. When an application root created from a PDB is first opened, each local user, role, and profile is marked as common. The procedures in the DBMS_PDB package associate the user, role, or profile with the application. Therefore, all DDL operations on the user, role, or profile must subsequently be done within an application BEGIN...END block of this application. When shared database objects exist in the application root, you must run procedures in the DBMS_PDB package to associate the database objects with the application as application common objects. Therefore, all DDL operations on the application common objects must subsequently be done within an application BEGIN...END block of this application. After the application root is in place, you can create application PDBs in the new application container using the existing PDBs. The application PDBs that you create must contain the application’s database objects, including their data. Additional steps are necessary to synchronize the application version and patch number and to establish shared database objects in the application PDBs. Choose one of the PDBs, and use the instructions in "Creating an Application Root Using an Existing PDB" to create the application root with this PDB. As part of this step, you associate the database objects, users, roles, and profiles with the application by running procedures in the DBMS_PDB package. Use the instructions in "Creating an Application PDB Using an Existing PDB" to create one hundred application PDBs using the PDBs that are running the application. An Oracle Database 12c Release 2 (12.2) CDB must exist. In the Oracle Database 12c Release 2 (12.2) CDB, create the application root by cloning the existing PDB, relocating the existing PDB, or by unplugging and plugging in the existing PDB. The new application root must contain all of the database objects used by the application. With the application root as the current container, start an application installation operation by issuing an ALTER PLUGGABLE DATABASE ... BEGIN INSTALL statement. Optional: Query the COMMON column in the DBA_USERS, DBA_ROLES, and DBA_PROFILES views to determine which users, roles, and profiles are common. Run the SET_USER_EXPLICIT procedure to set application common users. Run the SET_ROLE_EXPLICIT procedure to set application common roles. Run the SET_PROFILE_EXPLICIT procedure to set application common profiles. If you do not have EXECUTE privilege on the DBMS_PDB package, then you can run these procedures in the DBMS_PDB_ALTER_SHARING package. Optional: With the application root as the current container, query the SHARING column in the DBA_OBJECTS view to determine which database objects are shared. Run the SET_DATA_LINKED procedure to set data-linked application common objects. Run the SET_METADATA_LINKED procedure to set metadata-linked application common objects. Run the SET_EXT_DATA_LINKED procedure to set extended data-linked application common objects. Optional: Rerun the queries that you ran previously to ensure that the sharing properties of the database objects are correct and that the common properties of the users, roles, and profiles are correct. Optional: If existing PDBs use the application, then create application PDBs using these existing PDBs. See "Creating an Application PDB Using an Existing PDB". An Oracle Database 12c Release 2 (12.2) CDB must exist, and the application root to which the application PDB will belong must exist. The PDB must contain all of the application common objects used by the application. The application must be installed in the application root. In the application root, create the application PDB by cloning the existing PDB, relocating the existing PDB, or by unplugging and plugging in the existing PDB. Violations will be reported during PDB creation. Connect to or switch to the new PDB as a user with the required privileges. Run the pdb_to_apppdb.sql script in the ORACLE_HOME/rdbms/admin directory. Optional: Query the COMMON column in the DBA_USERS, DBA_ROLES, and DBA_PROFILES views to ensure that the common properties of the users, roles, and profiles are correct. Optional: Query the SHARING column in the DBA_OBJECTS view to ensure that the sharing properties of the database objects are correct. In addition to user-created applications, application containers can also contain implicitly created applications. An application is created implicitly in an application root when an application common user operation is issued with a CONTAINER=ALL clause outside of ALTER PLUGGABLE DATABASE BEGIN/END statements. Application common user operations include operations such as creating a common user with a CREATE USER statement or altering a common user with an ALTER USER statement. There are several other application common user operations. An implicit application is named APP$guid, where guid is the GUID of the application root. An implicit application is created when the application root is opened for the first time. Enter the name of the application for application_name. guid is the GUID of the application root. APP$CON is a logical application name that Oracle Database automatically translates to the real name of the implicit application. In SQL*Plus, ensure that the current container is the application PDB. The current user must have ALTER PLUGGABLE DATABASE system privilege. Run an ALTER PLUGGABLE DATABASE APPLICATION statement with the SYNC clause. This example synchronizes an application named salesapp with the latest application changes in the application root. This example synchronizes all of the applications in an application PDB with the latest application changes in the application root. This example synchronizes all of the implicitly-created applications in an application PDB with the latest application changes to the implicitly created applications in the application root. A proxy PDB can synchronize an application root and a replica based on the application root. When multiple application containers have the same application, you can use this technique to keep the application synchronized in all of the application containers. The application root and the application root replica can be in different CDBs. When multiple application containers must run the same application, the application in the application containers can be kept in using proxy PDBs. A particular application might be installed in several application containers. You can make installing, upgrading, and patching the application more efficient by using proxy PDBs. In this configuration, one application container has the master application root. The master application root is where the application is installed, upgraded, and patched. One or more application root replicas are copies of the master application root. Each application root replica will be referenced by a proxy PDB in the master application root. Whenever a proxy PDB is synchronized with the application changes in the master application root, it propagates those changes to its referenced application root replica. After an application root replica is synchronized with the changes from the master application root, application PDBs that are plugged into the application root replica can synchronize with it to get the changes also. Figure 44-2 shows a configuration that synchronizes an application root replica using a proxy PDB. Description of "Figure 44-2 Synchronizing an Application Root Replica with a Proxy PDB"
In addition, when an application root replica is configured and has its own application PDBs, a query that includes the CONTAINERS clause in the master application root can return data from the current application container and from the application container with the application root replica. The query can show results from the application root replica and from any open application PDBs plugged into it. Use a CREATE PLUGGABLE DATABASE statement to create the application container with the master application root. You can install the application in the application container now or at a later time. Create an empty application container using any supported method. Clone the master application root. If the port of the listener used by the application root replica is not 1521, then a PORT clause is required during creation. If the host of the application root replica is different from the host of the master application root, then a HOST clause is required during creation. This application root replica will be referenced by the proxy PDB. In the master application root, create a proxy PDB that references the application root replica you created in the previous step. Open and synchronize the proxy PDB. When the proxy PDB is synchronized, it propagates the changes in the master application root to the application root replica. Optional: In the master application root, modify the application by installing, upgrading, or patching it. Optional: Synchronize the proxy PDB with the application changes in the master application root by running the ALTER PLUGGABLE DATABASE APPLICATION statement with the SYNC clause. The hqdb CDB contains the application container with the master application root called msappcon. An application called sampleapp is installed in the msappcon master application root. The msappcon application root contains two application PDBs named mspdb1 and mspdb2. The msappcon application root also contains a proxy PDB named prxy that references the application root replica in the other CDB. The depdb CDB contains the application container with the application root replica called depappcon. An application called sampleapp is propagated from the proxy PDB prxy in the msappcon master application root and installed in the depappcon master application root. The depappcon application root contains two application PDBs named deppdb1 and deppdb2. This example shows how changes to the sampleapp application in the msappcon master application root are applied to the application PDBs in both CDBs when the application PDBs are synchronized. Create the application container with the master application root in the hqdb CDB. In SQL*Plus, ensure that the current container is the hqdb CDB root. Install an application in the master application root. Create and synchronize one or more application PDBs in the master application root. In SQL*Plus, ensure that the current container is the master application root. Create application PDBs in the master application root. Create the application container with the application root replica in the depdb CDB. In SQL*Plus, ensure that the current container is the depdb CDB root. If the port of the listener used by the application root replica is not 1521, then a PORT clause is required. If the host of the application root replica is different from the host of the master application root, then a HOST clause is required. Create and synchronize the proxy PDB in the master application root. Create and synchronize one or more application PDBs in the application root replica. Create application PDBs in the application root replica. Check the structure of the apptb table in an application PDB in the application root replica. In the master application root, upgrade the application. Synchronize the application PDBs in the application root replica and check for the application upgrade. Notice that the change in the application upgrade is reflected in the output because the widget_type column has been added to the apptb table. application_name is the name of the application, and application_version_number is the earliest compatible version. application_name is the name of the application. The current version is the version of the application in the application root. Run an ALTER PLUGGABLE DATABASE APPLICATION SET COMPATIBILITY VERSION statement. This example sets the compatibility version for an application named salesapp to version 4.2. This example sets the compatibility version for an application named salesapp to the current application version. The correct SQL*Loader module name must be specified between the ALTER PLUGGABLE DATABASE APPLICATION BEGIN and theALTER PLUGGABLE DATABASE APPLICATION END statements. The module name is SQL Loader Conventional Path Load. This module must remain set for the entire application install, upgrade, or patch operation. Run the ALTER PLUGGABLE DATABASE APPLICATION BEGIN statement for beginning an application installation, upgrade, or patch. Perform the conventional path load with SQL*Loader. Run the ALTER PLUGGABLE DATABASE APPLICATION END statement for ending an application installation, upgrade, or patch. Ensure that the application_name and application_version_number match in the ALTER PLUGGABLE DATABASE APPLICATION BEGIN INSTALL statement and the ALTER PLUGGABLE DATABASE APPLICATION END INSTALL statement. Synchronize all of the application PDBs that must include these application changes by issuing an ALTER PLUGGABLE DATABASE APPLICATION statement with the SYNC clause. In this example, the conventional path load is performed in an application root. In SQL*Plus, switch to the application root. Use SQL*Loader to perform the conventional path load. You issue ALTER PLUGGABLE DATABASE APPLICATION statements to uninstall an application from the application root. To unistall an application in from application container, run the ALTER PLUGGABLE DATABASE APPLICATION BEGIN UNINSTALL statement to begin the uninstallation and the ALTER PLUGGABLE DATABASE APPLICATION END UNINSTALL statement to end the uninstallation. The application uninstalled from the application PDBs that synchronize with the application in the application root. You uninstall the application from the application root only, and application PDBs that synchronize with the application uninstall the application automatically. The uninstall operation can be done with one or more of the following: scripts, SQL statements, and graphical user interface tools. You must indicate the start of the uninstallation with an ALTER PLUGGABLE DATABASE APPLICATION BEGIN UNINSTALL statement and the end of the uninstallation with an ALTER PLUGGABLE DATABASE APPLICATION END UNINSTALL statement. Each uninstallation must be associated with an application name and version number, which are specified in the ALTER PLUGGABLE DATABASE APPLICATION statements. Uninstalling an application does not remove the application from the data dictionary. It marks the application as UNINSTALLED so that upgrade, patch, and uninstall of the application is disallowed. Destructive changes to application objects are allowed during application uninstallation. Applications running in an application PDB continue to function during uninstallation and after the application is uninstalled from the application root. The application can continue to function in the application PDB because the ALTER PLUGGABLE DATABASE APPLICATION BEGIN UNINSTALL statement creates a clone of the application root called an application root clone. An application root clone serves as a metadata repository for old versions of application objects, so that application PDBs that have not been synchronized with latest version of the application can continue to function. Because the clone is created while the application PDB is open, local undo must be configured at the CDB level before an application can be uninstalled. An application upgrade also creates an application root clone. "Running Oracle-Supplied SQL Scripts in a CDB"
Uninstall the application using scripts, SQL statements, or graphical user interface tools. Ensure that the application_name matches in the ALTER PLUGGABLE DATABASE APPLICATION BEGIN UNINSTALL statement and theALTER PLUGGABLE DATABASE APPLICATION END UNINSTALL statement. Synchronize all of the application PDBs that must uninstall the application by issuing an ALTER PLUGGABLE DATABASE APPLICATION statement with the SYNC clause. Application common objects are created in an application root and are shared with the application PDBs that belong to the application root. There are three types of application common object: metadata-linked, data-linked, and extended data-linked. Some restrictions apply to application common objects. You create an application common object in an application root either by ensuring that the DEFAULT_SHARING initialization parameter is set to the correct value or by including the SHARING clause in the CREATE SQL statement. The rules are different for issuing DML statements on metadata-linked, data-linked, and extended data-linked application common objects. When you modify an application common object in an application root with certain DDL statements, you must modify the object between ALTER PLUGGABLE DATABASE APPLICATION BEGIN and ALTER PLUGGABLE DATABASE APPLICATION END statements, and application PDBs must synchronize with the application to apply the changes. You can create these types of database objects as application common objects by issuing the CREATE statement when the current container is the application root and specifying the sharing attribute for it. You can specify the sharing attribute by including the SHARING clause in the CREATE statement or by setting the DEFAULT_SHARING initialization parameter in the application root. When you set the DEFAULT_SHARING initialization parameter, the setting is the default sharing attribute for all database objects of a supported type created in the application root. However, when a SHARING clause is included in a CREATE statement, its setting overrides the setting for the DEFAULT_SHARING initialization parameter. METADATA: A metadata link shares the database object’s metadata, but its data is unique to each container. These database objects are referred to as metadata-linked application common objects. This setting is the default. DATA: A data link shares the database object, and its data is the same for all containers in the application container. Its data is stored only in the application root. These database objects are referred to as data-linked application common objects. EXTENDED DATA: An extended data link shares the database object, and its data in the application root is the same for all containers in the application container. However, each application PDB in the application container can store data that is unique to the application PDB. For this type of database object, data is stored in the application root and, optionally, in each application PDB. These database objects are referred to as extended data-linked application common objects. NONE: The database object is not shared. For tables (excluding object tables), the SHARING clause can be set to METADATA, DATA, EXTENDED DATA, or NONE. For object tables, only METADATA or NONE is valid. For views (excluding object views), the SHARING clause can be set to METADATA, DATA, EXTENDED DATA, or NONE. For object views, only METADATA or NONE is valid. For sequences, the SHARING clause can be set to METADATA, DATA, or NONE. With a metadata-linked sequence, each application PDB has its own sequence. When the metadata-linked sequence is incremented using the NEXTVAL pseudocolumn in one application PDB, it does not affect the value of the sequence in the other application PDBs in the application container. With a data-linked sequence, each application PDB shares the same sequence in the application root. When the metadata-linked sequence is incremented using the NEXTVAL pseudocolumn in one application PDB, all of the other application PDBs in the same application container also see the change. Application common objects can be created or changed only as part of an application installation, upgrade, or patch. An application PDB applies changes to application common objects when it synchronizes with the application that made the changes. If an application PDB is closed when an application common object is created, dropped, or modified, then the appropriate changes are applied in the application PDB when it is opened and synchronized with the application. The names of application common objects must not conflict with those of local database objects in any of the application PDBs that belong to the application root or Oracle-supplied common objects in the CDB root. If a newly opened application PDB contains a local database object whose name conflicts with that of an application common object, then the application PDB is opened in RESTRICTED mode. In this case, you must resolve the naming conflict before the application PDB can be opened in normal mode. For metadata-linked application common objects, the metadata for the object is stored once in the application root. A metadata link in each application PDB that belongs to the application root enables the application PDBs to share the metadata for the object, including the object name and structure. The data for the object is unique to each container, including the application root and each application PDB that belongs to the application root. Data definition language (DDL) operations on a metadata-linked application common object can be run in the application root only as part of an application installation, upgrade, or patch. However, the data can be modified in an application PDB using normal data manipulation language (DML) operations. For example, consider a company with several regional offices. The company wants the structure of the information about employees to be consistent, but each office has different employees. If this company has a human resources application in an application container, it can create a separate application PDB for each regional office and use a metadata-linked table to store employee information. The data structure of the table, such as the columns, is the same in the application PDB for each regional office, but the employee data is different. Another example might involve a company that builds and maintains a sales application that is used by several different businesses. Each business uses the same sales application, but the data for each business is different. For example, each business has different customers and therefore different customer data. To ensure that each client uses the same data structure for its application, the company might create an application container with metadata-linked application common objects. Each business that uses the sales application has its own application PDB, and the data structure is the same in each application PDB, but the data is different. For data-linked application common objects, both the metadata and the data for the object is stored once in the application root. A data link in each application PDB that belongs to the application root enables the application PDBs to share the metadata and data of the object. DDL operations on a data-linked application common object can be run in the application root only as part of an application installation, upgrade, or patch. In addition, the data can be modified using normal DML operations only in the application root. The data cannot be modified in application PDBs. For example, consider a company with several regional offices. The company wants the information about the products they sell, such as the product names and descriptions, to be consistent at all of the regional offices. If this company has a sales application in an application container, then it can create a separate application PDB for each regional office and use a data-linked table to store product information. Each application PDB can query the product information, and the product information is consistent at each regional office. Data-linked application common objects are also useful for data that is standard and does not change. For example, a table that stores the postal codes for a country might be a data-linked application common object in an application container. All of the application PDBs access the same postal code data in the application root. If the data-linked application common object is part of a configuration that synchronizes an application root replica with a proxy PDB, then DML operations on a data-linked object in the application root can be done outside of an application action, but the DML operation is not automatically propagated to the application root replication through the proxy PDB. If you want the DML operation to be propagated to the application root replica, then the DML operation on a data-linked object in the application root must be done within an application installation, upgrade, or patch. For an extended data-linked object, each application PDB can create its own specific data while sharing the common data in the application root. Therefore, only the data stored in the application root is common for all application PDBs. DDL operations on an extended data-linked application common object can be run in the application root only as part of an application installation, upgrade, or patch. However, the data can be modified in the application root or in an application PDB using normal DML operations. For example, a sales application in an application container might support several application PDBs, and all of the application PDBs need the postal codes in the United States for shipping purposes. In this case the postal codes can be stored in the application root so that all of the application PDBs can access it. However, one application PDB also makes sales in Canada, and this application PDB requires the postal codes for the United States and Canada. This one application PDB can store the postal codes for Canada in an extended data-linked object in the application PDB instead of in the application root. Tables and views are the only types of database objects that can be extended data-linked objects. If the extended data-linked application common object is part of a configuration that synchronizes an application root replica with a proxy PDB, then DML operations on an extended data-linked object in the application root can be done outside of an application action, but the DML operation is not automatically propagated to the application root replication through the proxy PDB. If you want the DML operation to be propagated to the application root replica, then the DML operation on an extended data-linked object in the application root must be done within an application installation, upgrade, or patch. Queries on application common objects can return data from a container that is not the current container. For example, when the current container is an application root, queries that include the CONTAINERS clause can return data from application PDBs for metadata-linked application common objects. Also, when the current container is an application PDB, queries on data-linked and extended data-linked application common objects return data that resides in the application root. In addition, queries on object tables and object views return no data from containers other than the current container. You can create a metadata-linked object, an extended data-linked, or a data-linked object in an application root as part of an application installation, upgrade, or patch. An application PDB applies changes to application common objects when it synchronizes with the application in the application root. The current user must have the privileges required to create the database object. Ensure that the DEFAULT_SHARING initialization parameter is set to the desired sharing attribute in the application root, and issue the CREATE SQL statement to create the database object. Issue the CREATE SQL statement, and include the SHARING clause set to METADATA, DATA, or EXTENDED DATA. When a SHARING clause is included in a SQL statement, it takes precedence over the value specified in the DEFAULT_SHARING initialization parameter. For example, if the DEFAULT_SHARING initialization parameter is set to METADATA in the application root, and a database object is created with SHARING set to DATA, then the database object is created as a data-linked database object. Once a database object is created, its sharing attribute cannot be changed. Synchronize all of the application PDBs that must apply these changes by issuing an ALTER PLUGGABLE DATABASE APPLICATION statement with the SYNC clause with the application PDB as the current container. This example sets the DEFAULT_SHARING initialization parameter to DATA both in memory and in the SPFILE. When a database object that supports sharing is created in the application root, and no SHARING clause is included in the CREATE SQL statement, the database object uses the sharing attribute specified in the DEFAULT_SHARING initialization parameter. This example creates the employees_md metadata-linked table by including the SHARING=METADATA clause. The application_name is salesapp and the application_version_number is 4.2, and the object is created during application installation. This example creates the product_descriptions_ob data-linked table by including the SHARING=DATA clause. The application_name is salesapp and the application_version_number is 4.2, and the object is created during application installation. This example creates the postalcodes extended data-linked table by including the EXTENDED keyword and the SHARING clause. The application_name is salesapp and the application_version_number is 4.2, and the object is created during application installation. This example creates the departments_ns table and specifies that it is not a shared common application object by including the SHARING=NONE clause. After creation, this database object can be accessed only in the application root. The ALTER PLUGGABLE DATABASE APPLICATION BEGIN and END statements are not required when you create an object that is not a shared common object. However, if you create an object that is not shared in between ALTER PLUGGABLE DATABASE APPLICATION BEGIN and END statements, then the object is created in application PDBs that synchronize with the application. Metadata-linked application common objects: DML statements can be issued on metadata-linked application objects normally. For metadata-linked application common objects, the structure is the same in all containers in an application container, but the data is different. Users and applications can issue DML statements on these objects in the same way that they would for ordinary database objects, and the DML statements only affect the current container. After setting this attribute, queries and DML statements issued in the application root use the CONTAINERS clause by default for the database object. The CONTAINERS_DEFAULT column in the DBA_TABLES and DBA_VIEWS views shows whether the database object is enabled for the CONTAINERS clause by default. Data-linked application common objects: DML statements can be issued on data-linked application objects normally in the application root. DML changes in the application root affect the data available to all of the application PDBs in the application container. DML statement cannot be issued on data-linked application objects in application PDBs. Extended data-linked application common objects: DML statements can be issued on extended data-linked application objects normally in the application root and in application PDBs. DML changes in the application root affect the data available to all of the application PDBs in the application container. DML changes in an application PDB only affect the data that is unique to the application PDB. Consider an application root that has data-linked or extended data-linked objects, and assume that this application root is the master application root for one or more application root replicas that are synchronized with proxy PDBs. In this configuration, DML changes are only synchronized with the application root replicas when the DML statements are issued during an application installation, upgrade, or patch. Specifically, DML changes must be issued in the application root between ALTER PLUGGABLE DATABASE APPLICATION BEGIN and ALTER PLUGGABLE DATABASE APPLICATION END statements. DML changes made outside of an application installation, upgrade, or patch only apply to the current application root and are not synchronized with application root replicas. Connect to the appropriate container in the application container as a user with the privileges required to issue DML statements on the database object. In SQL*Plus, ensure that the current container is the master application root in the application root replica in the configuration. The current user must have the privileges required to issue the DML statements on the database object. Issue the DML statements on the data-linked application common object. Ensure that the application_name and application_end_version_number match in the ALTER PLUGGABLE DATABASE APPLICATION BEGIN UPGRADE statement and ALTER PLUGGABLE DATABASE APPLICATION END UPGRADE statements. Synchronize all of the application PDBs that must apply these changes by issuing an ALTER PLUGGABLE DATABASE APPLICATION statement with the SYNC clause when the application PDB is the current container. You can alter a metadata-linked object or a data-linked object in an application root. You run an ALTER, RENAME, or DROP SQL statement on the database object to perform a DDL change. The current user must have the privileges required to make the planned changes to the database object. Modify the application common object with the DDL statement. For example, an ALTER TABLE statement might add a column to a table. DML statements can affect database objects in more than one container in an application container. To specify the default container for DML statements in an application container, issue the ALTER PLUGGABLE DATABASE statement with the CONTAINERS DEFAULT TARGET clause. In an application root, a single DML statement that includes the CONTAINERS clause can modify a table or view in one or more containers in the application container. To use the CONTAINERS clause, specify the table or view being modified in the CONTAINERS clause and the containers in the WHERE clause. A target container can be specified in an INSERT VALUES statement by specifying a value for CON_ID in the VALUES clause. Also, a target container can be specified in an UPDATE or DELETE statement by specifying a CON_ID predicate in the WHERE clause. The values specified for the CON_ID in the WHERE clause must be for containers in the current application container. In addition, you can enable the CONTAINERS_DEFAULT attribute for a table or view in an application root. When this attribute is enabled, the CONTAINERS clause is used for queries and DML statements on the database object by default, and the CONTAINERS clause does not need to be specified in the SQL statements. To enable the CONTAINERS_DEFAULT attribute for a table or view in an application root, run the an ALTER TABLE or ALTER VIEW statement with the ENABLE CONTAINERS_DEFAULT clause. A multi-table INSERT statement where the target of the INSERT is in CONTAINERS() is not supported. When a DML statement is issued in an application root without specifying containers in the WHERE clause, the DML statement affects the default container for the application container. The default container can be any container in the application container, including the application root or an application PDB. Only one default container is allowed. The current user must have the commonly granted ALTER PLUGGABLE DATABASE privilege. Run the ALTER PLUGGABLE DATABASE statement with the CONTAINERS DEFAULT TARGET clause. This example specifies that APDB1 is the default container for DML statements in the application container. This example clears the default container setting. When it is not set, the default container is the application root. A container map is a database property that specifies a partitioned map table that is defined in an application root. A container map can be used to partition the data in metadata-linked objects in an application container. Container maps partition data in application PDBs based on a commonly-used column. You create a container map by creating a map object and setting the CONTAINER_MAP database property to the map object. A container map can define a logical partition key on a column for a common object. This mapping removes the requirements for defining a query with a CON_ID predicate and the need to use the CONTAINERS clause because the container is resolved internally based on the container map. Container maps are often useful when you are migrating from row based consolidation that uses a tenant ID with multiple tenants in a single PDB to a configuration that uses a different PDB for each tenant. The names of the partitions in the map object match the names of the application PDBs in the application container. The column used in partitioning the map object must match a column in the metadata-linked object. 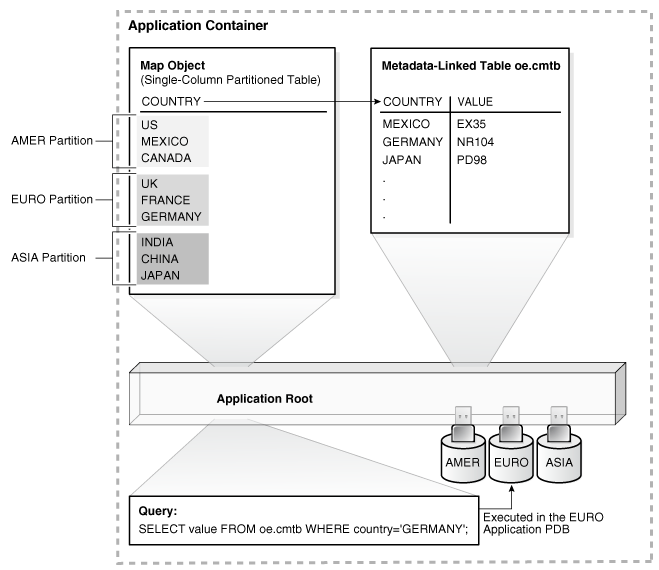 The metadata-linked object is not physically partitioned at the table level, but it can be queried using the partitioning strategy that is enabled by the container map. The following illustration shows, in an application root, a map object, a metadata-linked table, and a query on the metadata-linked table. The query is executed in the appropriate application PDB. 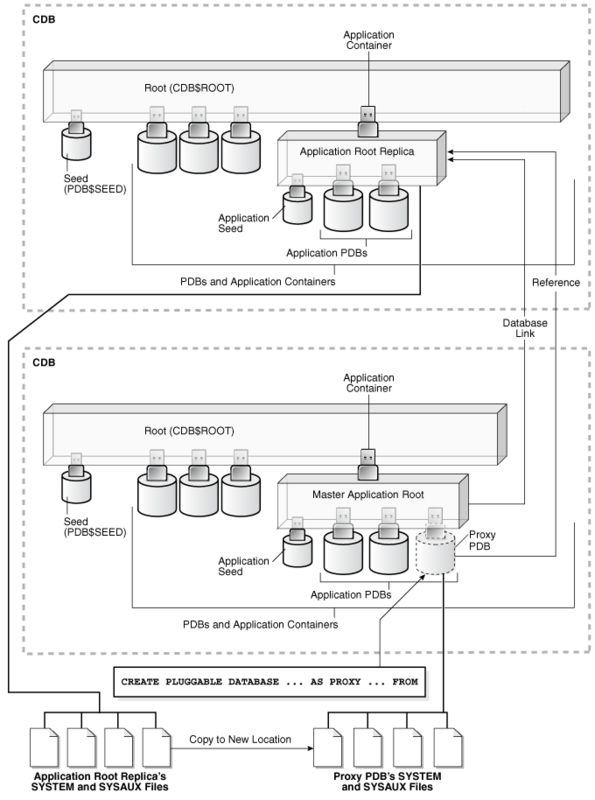 Description of "Figure 44-3 Container Map"
The illustration shows an application container with three application PDBs named AMER, EURO, and ASIA. The application PDBs store data for the different regions (America, Europe, and Asia, respectively). A metadata-linked table named oe.cmtb stores information for an application, and this table has a COUNTRY column. For this partitioning strategy, partition by list is used to create a map object that creates a partition for each region, and the country value is used to determine the region. This example is described in detail in "Creating a Container Map". The CONTAINERS clause is unnecessary when a container map is defined. As shown in the first query with the CONTAINERS clause, when the query only pertains to a single application PDB, the query must specify the container ID of this application PDB in the WHERE clause, and this requirement might cause application changes. The second query that uses the container map, replacing the CONTAINERS clause, does not specify the container, because the container map directs the query to the correct application PDB. In addition, queries that use container maps are generally more efficient than queries that use the CONTAINERS clause. The container map must be created by a common user with ALTER DATABASE system privilege. Queries run against an object that is enabled for container map, and query privileges are determined by privileges granted on the object. Container maps cannot be created in the CDB root. There is a limit of one container map for each application container. Data must be loaded into the PDBs’ tables in a manner that is consistent with the partitions defined in map object. When there are changes to the application PDBs in an application container, the map object is not synchronized automatically to account for these changes. For example, an application PDB that is referenced in a map object can be unplugged, renamed, or dropped. The map object must be updated manually to account for such changes. The map object is a partitioned table in which each partition name matches the name of an application PDB in an application container. Before creating a container map, an application container with application PDBs must exist in the CDB. The application container must have at least one application installed in it. The tables that will be queried using the container map must have a common column. Set the CONTAINER_MAP database property to the map object. Replace map_table_schema with the owner of the table, and replace map_table_name with the name of the table. Start an application installation, upgrade, or patch. If the metadata-linked table that will be used by the container map does not exist, then create it. Enable the container map for the table to be queried by issuing an ALTER TABLE statement with the ENABLE CONTAINER_MAP clause. Ensure that the table to be queried is enabled for the CONTAINERS clause by issuing an ALTER TABLE statement with the ENABLE CONTAINERS_DEFAULT clause. End the application installation, upgrade, or patch started previously. This example creates a simple application that uses a container map. Assume that an application container has three application PDBs named AMER, EURO, and ASIA. The application PDBs store data for the different regions (America, Europe, and Asia, respectively). A metadata-linked table stores information for an application and has a COUNTRY column. For this partitioning strategy, partition by list is used to create a map object that creates a partition for each region, and the country value is used to determine the region. Create a metadata-linked table that will be queried using the container map. Enable the container map for the table to be queried. Ensure that the table to be queried is enabled for the CONTAINERS clause. Switch session into each application PDB and synchronize it. Insert values into the oe.cmtb table in each application PDB based on the partitioning strategy. Switch session into the application root and query the data using the container map. The output for the first query should be AMER VALUE, the output for the second query should be EURO VALUE, and the output for the third query should be ASIA VALUE. These values illustrate that the container map is working correctly.